+ This wasn't intended to be a comprehensive survey of ice cream in this area. + All scoops were bought on June 9 by asking for "one scoop of vanilla ice cream in a cup." + Scoop weight was measured by weighing the scoop in a cup, weighing the empty cup, and then subtracting the weight of the cup from the first measurement. The scale we used is not a scientific instrument -- we bought it off the shelf at Target. + We visited the Coldstone at Stuyvesant Plaza, Stewart's on Western at Russell in Albany, and the Ben and Jerry's on Lark. + The taste comments are totally subjective and not based on direct side-by-side comparisons. + Scoops will probably always be variable, in part because different people -- even in the same shop -- are making the scoops. Your scoop mileage will almost certainly vary. Based on this limited survey, it would appear that Emack and Bolio's does have scoops that are on the smaller side. That said, its ice cream was also our clear favorite. And a second a scoop there is just 50 cents more, which -- if the second scoop is the same as the first -- would make the ice cream .53 per oz. That's right in line with the other stores. But just a single scoop there is pricy. The best bargain might be at Stewart's. Not only did it have the cheapest ice cream per ounce, it also tasted pretty good. I scream for this kind of data. Ba-dum ching! Thank you, thank you, I'll be here all night. You guys are the best. Stuff like this is why I love this site! I worked in an ice cream shop for years (none of the ones visited), Some things you didn't take into consideration. The original complaint was the size of a scoop. You measured the scoop by weight... the quality of the Ice cream, specifically the butter fat content will effect the weight. Higher Butterfat makes it creamier, but also heavier (so a smaller scoop could still weigh more). And the amount of air in the ice cream when it was churned. Not to mention temperature, will all effect weight not necessarily the size of the scoop. @MAC: You're right to point out all the variables at work here. 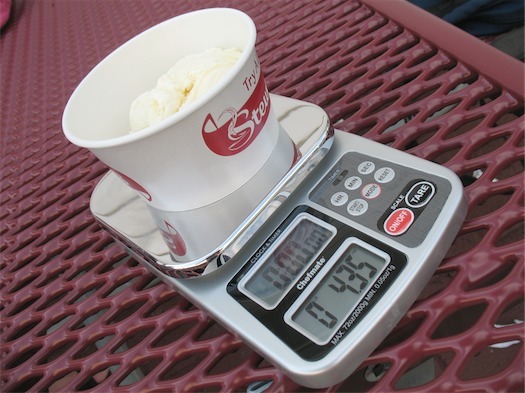 We chose to measure the scoops by weight because that seemed -- to us -- to be the fairest way of determining "how much" ice cream you're getting. We probably could have also measured it by volume, though that would have been trickier (and messier). As for butterfat content, we don't have totals for each brand. But during our short conversation with the founder of Emack and Bolio's last week, he mentioned that their ice cream is around 14% butterfat, which is at the higher end of the scale. That may be another reason their first scoop is a little pricy. It probably also explains, in part, why it tastes good. The less expensive ice creams have more air so Stewart's small cone appears to be very generous (it really looks like quite a lot when I've ordered it) but the data above shows that a scoop of Stewart's ice cream weighs only a little more than the dense ball of Emack & Bolio's. The other variable--for the consumer--is not just the differences among scoop sizes, but the even vaguer definition of "small." I recall Stewart's puts a couple of (admittedly airy) ice cream on its small cone. I have never worked in an ice cream shop, but I bet it takes practice to serve up a consistent scoop every time. I've sometimes been served a scoop that is practically hollow. A wife of mine (who shall remain nameless) tells me that you guys got a mingy serving at Stewart's. A small cone is supposed to be 5 ounces. I always, always order a 'small' at ice cream shops, because my friends will order mediums or larges, and yet all our cones are the same size! So ... I pay less, but get the same thing (pretty much)! I like soft-serve..so technically, I am not a scoop person more of a swirl.. I work at a Stewarts, and its true, our scoops are ment to be 5oz. It takes alot of practice, to hit that number. Even with the vanilla, because people think of a certin size, but when scooping, you also have to consider if the ice cream has other things in it. Chips and chunks add weight, but not much volume, so even if it is 5oz, people feel like they didnt get enough. Also, some on the ice creams are hard, and some are very soft. When there is a very hard ice cream, you hardly ever get a 5oz scoop. You get small this slices, so you have to build it up, and it gets hard to track. But then others are SO soft, they melt off the cone. Has anyone ever tried Tastee Treat's homemade ice cream? It's made on the premises as well as the Waffle cones. They have flavors such as Razzmatazz, it's a black raspberry ice cream with a red raspberry sauce going thru it. They even made a Bacon ice cream, it's a maple flavor ice cream with bits of Bacon going thru it. They have food there as well, hamburgers, hot dogs, and their fish fry's are the best. They have a playground for the children, a pavillon, and every Thursday, they have Cruise-In night, vintage cars. Their located at 2070 N Scotland Rd, Slingerlands......on the left hand side, next to Long Lumber.